Morex Information Ent., Co., Ltd, based in Taipei, Taiwan have been manufacturing and marketing PC cases since 1986. 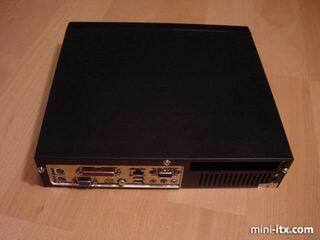 The Cubid 2677R "Super Mini Case" is one of 3 in the Cubid range, the 2677, 2677R (includes a PCI riser and PCI slot) and the 2688R (additional USB ports at the front). The Cubid 2677 measures (WxHxD): 11.50"(295mm) x 2.50"(63.5mm) x 10.75"(273mm). It weighs approximately 3.3Kg, including the packaging. The case is of a solid cold rolled steel construction, and comes in 2 colours - black and white. You can probably see that we had the black model. 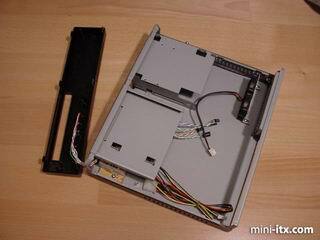 The top half of the case is removed by unscrewing 3 screws at the back and sliding the top off. This is a great help during construction, to sort out those minor niggles. Or perhaps you just like watching the twin fans go round whilst the PC is on. The fans themselves are curiously mounted a couple of inches away from the back of the case. We're not sure why this is - perhaps it is the optimal airflow position. 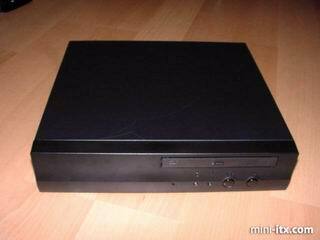 The sturdy plastic front panel is held to the front of the case by 2 screws, and contains the Power and Reset switches, 2 LEDs and a cutout for a Slim type (Laptop style) CD or DVD drive. This is initially covered, should you not have such an animal to hand. Now's probably a good time for you to have a quick peek at Morex's product page before we install a Mini-ITX motherboard.